This July, a Soyuz launcher will orbit the 1st of 3 European MetOp1 weather satellites. MetOp-A will be carrying the IASI2 instrument developed by CNES in partnership with Eumetsat3 to bring meteorologists new atmospheric measurements of unmatched quality. The satellite is now preparing to leave EADS Astrium’s facility in Toulouse, France, for its launch site. Today’s weather forecasts are reliable out to around 7 days. In the last 20 years, weather services have made great strides but one of the main barriers to better weather forecasting today is our sketchy knowledge of atmospheric humidity and temperature profiles. This is precisely the area where IASI—the leader of a new generation of optical instruments—is poised to provide a major leap in capability. IASI will measure infrared spectra in the lower atmosphere (troposphere and lower stratosphere) to establish humidity and temperature profiles twice as accurate as the current generation of spaceborne atmospheric sounders. This information will make it possible to deliver high-quality forecasts at longer ranges than ever before, while also improving short-range forecasts. IASI will also study greenhouse gases, evaluate ozone levels and collect data on cloud cover. IASI data will therefore benefit not only weather forecasting but also provide unprecedented information to better understand and monitor climate change. 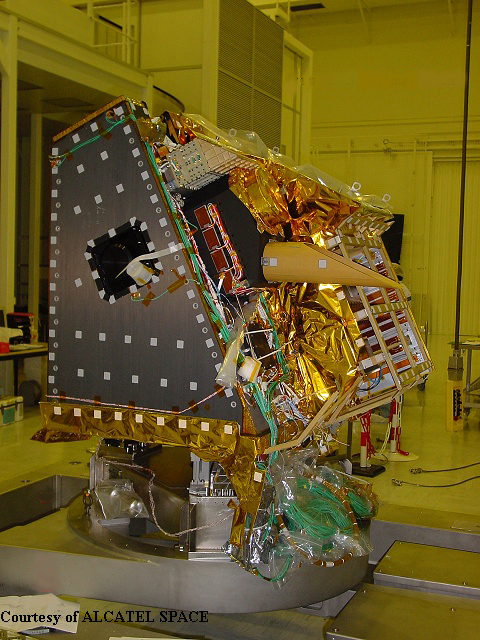 The 3 IASI instruments were developed by Alcatel Alenia Space and are part of the payload on the 3 MetOp European weather satellites designed to monitor climate and improve weather forecasting. These 3 satellites will be launched in succession into an 840-km Sun-synchronous orbit over a period of 14 years starting in 2006. The 1st IASI instrument has been integrated on the 1st of the MetOp satellites and has completed functional verification tests. The satellite and its payload, which also includes the French Argos-3 and Sarsat-3 instruments, will be arriving shortly at its launch site in Baikonur, Kazakhstan, where it is scheduled for lift-off atop a Soyuz/ST Fregat launcher in July.